A few months ago we were flying somewhere where I wouldn't be able to take my rack. I've used the tuner out feature exclusively on the Revelation, and was very surprised when I plugged my Strobo-stomp 2 in between the guitar and volume pedal. It is advertised as "true-bypass" and may be, but it sure had an effect on the tone. Yes, I made sure the dip switches were in the right positions for true-bypass. It still muddied up the tone. On a pot pedal, I installed another jack and jumped its hot wire off the input jack with a 1 meg resistor inline. The ground is just tied from the back output jack. Problem solved! I can leave my tuner plugged in all the time with it turned on without any effect on my tone. Mighty simple solution to a problem I know some of you are battling with. I talked some with Brad Sarno before I tried this and his thought was, "I can't believe we haven't been doing this for 30 years." A 1 meg resistor will cost you about a quarter at Radio Shack. Put it in and your good to go. This is the same setup I use when I take the Sarno Classic preamp with me as well, which doesn't have a tuner out. The 1 meg resistor isolates the signal and doesn't let anything from the tuner get back into your signal path. The Ernie Ball pedals have a tuner out as well but they are wired direct without a resistor inline, and you do lose tone. A half meg resistor wasn't enough and I could hear some signal loss so I went to 1 meg. Like I said, Mighty cheap and simple solution for a substantial problem. You should be able to leave any brand or model of tuner plugged in all the time with no signal degradation. Thanks for the tip !! Buncha CRAP !! But someday Ima get me some good gear !! It's funny to think that such an inexpensive part can have that big of a impact on tone. We as Steel players spend big money and lots of time to make sure we don't degrade our tone. It's also great that a player of your level is willing to share tips of the trade with the rest of us. Thanks again! Randy, please tell me if I'm wrong, but could you (I) make a simple project box that would have two female jacks, run one lead from it to the second output jack of the volume pedal and plug the Stropoflip tuner into the other end and have the two jacks connected with a resistor inside the box? That way it could be used with any volume pedal that had two outputs. Would it work? the difference between Randy�s proposal and your idea is that his parallel jack (connected through the 1Meg resistor) derives it�s signal from the input, allowing him to tune silently with the pedal down. Input and pedal out are connected directly, a 3rd jack (tuner out) is connected through the 1Meg resistor. Plug it right between your guitar and the pedal / tuner. But the beauty to Randy�s idea is that you wouldn�t have to lug another box around, so I second his plan to put this "Mod" (Oops, be careful with that word these days ) into the volume pedal directly, as many pedals have three jacks to use already. Keith Hilton has a modification for his Pedals that will make the second output jack a "tuner out". Jerry, I would think your idea would work. The folks who use the Strobo-Flip could make a box that plugs direct into the guitar (like a Bosstone) with two output jacks, running one with the resistor to the tuner, and the other to the volume pedal. This way you could use a very short cord to your tuner instead of a longer one coming back up from the volume pedal. If I used a Strobo-Flip instead of the Strobo-Stomp, this is what I'd do. I don't see any reason why this wouldn't work with a Hilton or Lemay pedal? This way you could always leave it plugged in and turned on without it having any effect on your tone, and be able to silently tune. Good idea Jerry! Pit, I didn't think about that either. That 1 meg resistor is small enough to fit inside a 1/4" plug. You could even make a Y-cord with the resistor in one of the plugs and eliminate the box altogether. For the "Flip" guys, or ones that mount the tuner on the leg of your guitar, it could be a short length to the tuner, then regular length to the volume pedal. Can one of you guys provide us with a wiring diagram to make sure we get it right! I would have to install the 3rd jack in my VP, same as you Randy. I have my pedals wired with a tuning out ( or parallel input) without a resistor (yet!!) and it does rob the tone if you plug your tuner in there. But, if I use a buffer like a Match Box or a Freeloader between the guitar and the pedal I don`t hear any loss. Am I wrong, again ? Randy, it is amazing that you posted this at the time you did. I recently acquired the Stroboflip and like it very much but I noticed I was getting a slight overdriven sound and went thru a phase of changing amps/gear for about a month before I realized this did not happen when I unplugged the tuner. Terry Bethel and I had a discussion on this the last time I saw him. He has installed a switch under his guitar to cut the tuner out so this is a concern of a lot of us. I intend to do something with your idea. Maybe Brad, Keith or LeMay or perhaps you Randy could market a "tuner box"? I particularly like Pit's idea of a short cord with a resistor in one of the jacks. That might be my solution. There is a unit called a "Jerry Rig" that has been sold here on the Forum. It is basically an A/B box with an on/off switch for a tuner. Works very well. It plugs right into your guitar. Can you explain what you meant by the Hilton modification? I have a Hilton with 2 outs, and I use the second one for a tuner out... are you saying that using it this way would somehow affect the tone from the other output? Or is it just to switch the main output on/off to achieve a tuner-mute feature? I am also interested in the Hilton mod. The way the pedal is wired now, if you use the 2nd output for a tuner, when you cut back on the volume, you cut back on the amount of signal going to the tuner. I'm sure with the mod, the signal from the pickup is not diminished by pedal position. I'm not much of an electronics guy, just a solder connection here and there is my limit. Keith could fill you in I'm sure on how to do this. The two outputs on the pedals are usually parallel outputs to feed two amps, so using one of them wouldn't allow silent tuning. On a pedal that has a buffer like the hilton or Lemay there should be no tone loss if the connection is after the buffer. 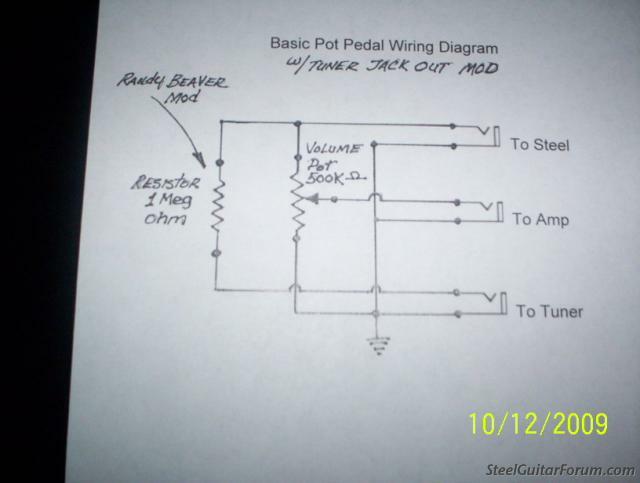 I would think if you are not using the second output to feed a 2nd amp, or effect of some kind, you could unhook it from the circuit, then tap onto the lead terminal of the jack that comes from the guitar, put the resistor inline to the extra jack and it should work just like it does on a pot pedal. Then you would be able to tune silently with no change to your tone. I'm sure someone here would be much better at creating and posting a wiring diagram that I. I still struggle with stick people. For the guys that mount the tuner on the leg of their guitar, I'm still liking the idea of making a Y cord with the resistor in the shorter length that feeds the tuner. No boxes, no extra gear to keep up with, and the ability to tune silently without having to do anything extra like flipping a switch. That's a pretty clever idea! I like it. I don't have exactly what Keith does, but basically the second jack is disconnected from the first jack and wired separately with a resistor and cap connected to a voltage divder in the "feedback" circuit of the output op amp. With this "mod" the second jack can be a "tuner jack". Keith explained it to me in St Louis but most of it went in one ear and out the other as I was trying to listen to him and who was on stage at the same time. Is this pretty close to what we're thinking here? Posted 10 Dec 2009 5:56 pm Signal Flow? Steelers, the signal flow is as Pit has said "From" the Steel, To the Amp and To the Tuner. Was not an intentional error. I do hope this helps someone. Posted 10 Dec 2009 8:47 pm Goodrich passive pedal? Couldn't a person modify a Goodrich 120 to do this easily as well? That's what Randy is talking about - modding a standard pot pedal such as a Goodrich 120. My reference to the Hilton is only for the Hilton pedals. thanks for that schematic drawing. That's it! I opend up my Goodrich. Looks really easy. The hardest part will be finding a one meg-ohm resistor. Radio Shack seems to only sell cell phones and mini-R/C helicoptors anymore. I'd be looking for a brown-black-green resistor, right? I've got a coffee can full of em. Found a brown-brown-green one. I'll try it. Thank you for the post Brad, had to hand draw most of it and take a photo. I don't have a decent draw program on my computer. The beauty of this set up is that, the tuner is practically transparent to the amp. If you want the amp to be silent, just rock back on the foot pedal. That would send "0" signal to the amp, while the tuner still receives a usable signal from the steel. According to Randy Beavers, the tuner stills gets enough signal to work perfectly. I believe he said he is using a Strobo Flip, but no matter, most should work. I know some players have their volume pedals set so they "never" cut fully off. In that case some sort of a switch in the circuit might be the best option. That is what I built and am currently using. A "Y" cable built with the 1 Meg Ohm Resistor in the "Tuner Leg" of the Y would work exactly the same way. That could be about the same cost without modding the foot pedal. Another option. To give credit where it's due, I had the idea to do this, but me having as little knowledge as I do about electronics, I didn't even know where to start with the resistor values. Brad suggested I start with a 1/2 meg, and when that didn't totally solve the problem he suggested a 1 meg. So once again, he came to our rescue! Jack, is there any reason this wouldn't work on the Hilton? The tuner is the only thing going to get signal from this jack, and it doesn't care if it's buffered or not. Tom, Radio Shack is where I bought mine. They have these steel cabinets with pull out drawers where they keep them. A card of 5 cost under a buck and a half.